Southern Africa Recordist Trainees - Great News! In our article It's Tigeriffic! Dalene Visits Australia! 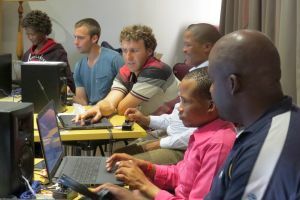 we mentioned a recording training course for Bible translators that ran in South Africa. Noel Bachelor was back home for just a few days when he received an email from one of his excited students. The student reported that he had recorded three Bible stories which some Bushmen, who speak that language, are currently checking. He had trained three more people to record, and after he reported back on what he had learned at a meeting, the committee members allocated money to build a studio (which is now under construction).